Jim Cramer and Tim Collins explore why investors seem disgruntled in the happiest place on earth. Even with strong earnings results, two blockbuster movie franchises, and a roaring theme park business, Walt Disney Co. (DIS - Get Report) can't seem to get any respect these days. That's why on Mad Money Tuesday night, Jim Cramer checked in with Real Money Pro contributor Tim Collins to explore how the magic went missing. Cramer and Collins started by looking at the past year's performance. The stock has been oscillating in a range for a year now, even as its Marvel properties put up blockbuster numbers and with a new Star Wars movie due out in a few days. Cramer and Collins found it even more puzzling because Disney's been buying back stock. But investors remain focused on subscriber loss numbers at ESPN. Collins and Cramer theorize that the latest Supreme Court ruling striking down a federal ban on sports gambling will help ESPN, since gamblers will want to watch what it is they're betting on. As Collins pointed out to Cramer, the past year's stock chart a head-and-shoulders pattern so obvious that even Goofy could identify it. The pattern is reliably bearish, and according to Collins, the neckline of this pattern sits at $99 and extends all of the way back to last September. If Disney breaks down below $99, it could potentially have another dozen points of downside before it finds its footing. If Disney pulls back below this level on a weekly basis, then Collins says it's time to sell the stock. Actually, he thinks you should wait until it pulls back below $98 just in case it overshoots to the downside before bouncing. Basically, this head-and-shoulders patterns means that if you buy Disney, your risk is well-defined. And given that the stock is currently at $102 and change, your potential losses would be contained if you take Collins' advice. But why buy Disney in the first place? Collins says the stock is very close to invalidating this whole head-and-shoulders formation. Disney's pressed up against a ceiling of resistance that lines up with the right shoulder. If it rallies a dollar from here, the whole bearish pattern is finished. In other words, Collins thinks that there are a bunch of short-sellers who will be forced to cover their positions, meaning buy back the stock, if Disney can just advance $1. The full stochastic oscillator (down at the bottom), which helps technicians detect when a stock has gotten overbought or oversold, made a bullish crossover recently, where the black line goes above the red one. At the same time, they're picking up from extreme oversold territory, meaning the stock went down too far too fast when it sold off earlier this year. Collins thinks it's due for a nice bounce. For example, when the stochastics did this same thing last July, the stock caught a small pop. When they did it again in October, there was a bigger move. Collin's near-term target for Disney is $108, with a retest of the stock's $112 high probable before the end of the year. 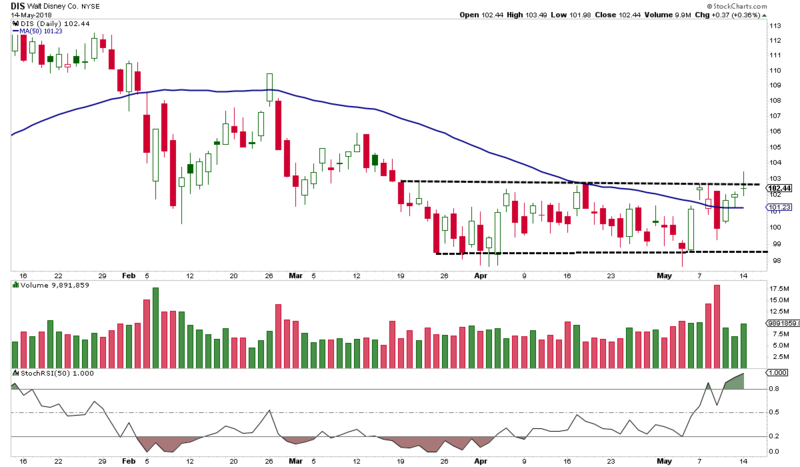 Collins and Cramer next looked at the daily chart, which is similar, only without the grim head-and-shoulders pattern. Disney's pressing against its ceiling of resistance here, at $102.75, just a few nickels and dimes above where it's currently trading. In other words, if Disney can rally 30 cents from these levels, Collins thinks the chart will become a lot more bullish and more momentum oriented traders will start buying. On top of that, the stock has now had multiple closes above its 50-day moving average. This is something that Disney had struggled with since early February, so Collins thinks this change of character is worth noting. Ironically, while the averages got punished Tuesday, Disney continued to hold up just fine. Now, Disney also got hit last week on high volume, and this is something the bears might use to argue that the stock really wants to go lower. But Collins has a different take because those sessions were immediately followed by a nice bounce. To him, it looks like the many of the weak hands got washed out, leaving Disney with a more confident shareholder base. The stochastic Relative Strength Index, a powerful momentum indicator, surged to new highs during last week's mini sell-off. This is what chartists call a positive divergence -- when a stock is going lower but your technical tools say it should be going higher. Sure enough, Disney quickly made up all of those losses and then some. 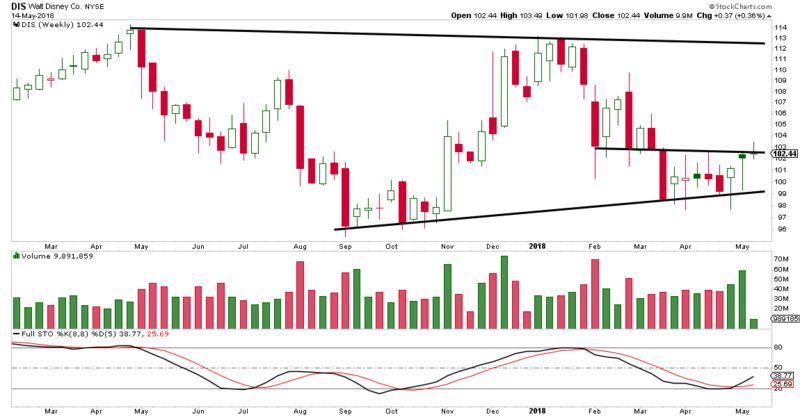 On the daily chart, Collins says his near-term target is $105. That may not sound like much, but he's talking about something that could happen in the next few weeks at most. As Collins sees it, Disney has very well-defined risk reward: if the stock goes below $98, the bulls lose, and he wants to be a seller because he thinks that could signal a big breakdown. But above $103 he expects Disney to give investors a big breakout to the upside. Cramer and the AAP team say they're not itching to buy under these conditions, but are keeping an eye on WestRock (WRK - Get Report) and Textron (TXT - Get Report) . Find out what they're telling their investment club members and get in on the conversation with a free trial subscription to Action Alerts PLUS. Over on Real Money, Cramer says that for Home Depot (HD - Get Report) , it really was the weather. Get more of his insights with a free trial subscription to Real Money. At the time of publication, Cramer's Action Alerts PLUS had a position in WRK and TXT.